Watershed ecology is all about connections, and one of the most important ways we measure track connections is through the food web. At KBNERR’s watershed research, we explore how landscapes processes support juvenile salmon in many different parts of the watershed, from headwater streams to estuaries. Those studies often involve learning what the salmon are eating, and this presentation will showcase several examples of what we’ve learned. For this talk, we’re going to take a look at juvenile salmon diets from several different locales. We’ll begin in the ‘headwater stream district’ – the uppermost branches of the watershed. These are very small streams that are very tightly connected to the surrounding landscape. Downstream areas receive flow from upstream sources, but headwaters are the beginning so all of the food in headwaters must be generated from nearby sources. Next we’ll travel all the way down to the other end of the watershed, where the rivers meet the sea-the estuaries. Here we have the influence of the ocean tides and the freshwater watershed- we’ll call this ‘fusion cuisine’. We’ll also take a look at imported foods and junk food in in juvenile salmon diets in our area. Coowe is the Program Watershed Ecologist and acting Research Coordinator for the Kachemak Bay National Estuarine Research Reserve (KBNERR), located in Homer, Alaska. She works collaboratively with colleagues from universities across the US to conduct research that improves understanding of how landscapes are connected with aquatic systems, and how human activities affect those systems. She has been with KBNERR for 18 years, and enjoys celebrating grant successes with single malt scotch. 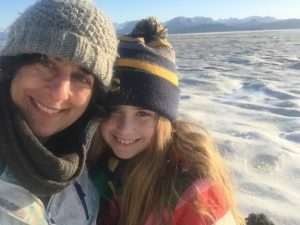 She lives with her husband, son, daughter, two dogs, eight chickens, cat and two guinea pigs at the head of Kachemak Bay.